Does your child have difficulty with daily routines like homework? Dr. Hellerstein has helped thousands of children blossom in school with her breakthrough process, SEE IT. SAY IT. DO IT!®. Now, parents can bring her techniques home in this fun companion workbook, developed in collaboration with Occupational Therapist Beth Fishman McCaffrey, OTR, COVT, and Early Childhood Educator Patricia Dunnigan. This simple, easy-to-use workbook walks parents and teachers through a step-by-step process to guide children to visualize goals and create action plans. It provides scripts, fun exercises, and ready-to-go templates to give children confidence and a lifetime love of learning. 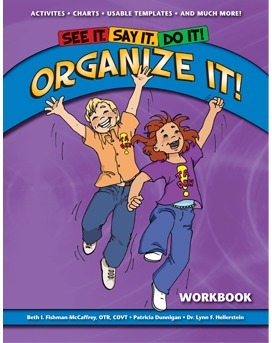 The organizational charts, calendars, and motivational activities will help you develop an easy, kid-friendly organization system for your child’s daily routines including chores, homework and other activities. This eliminates frustrations and arguing over doing and completing the tasks! Parents often use the charts for themselves. Dr. Lynn F. Hellerstein, O.D., FCOVD, FAAO, is a pioneer in vision therapy. For over 33 years, she has successfully treated thousands of children and adults with learning and visual difficulties. She also works with athletes to improve their sports performance. A founder of Hellerstein & Brenner Vision Center, P.C. in Centennial (Metro Denver), Colorado, she is also the author of the award-winning book, SEE IT. SAY IT. 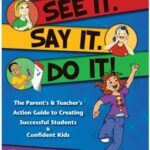 DO IT!®: The Parent’s & Teacher’s Action Guide to Creating Successful Students and Confident Kids, and SEE IT. SAY IT. 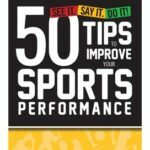 DO IT!®: 50 Tips to Improve Your Sports Performance. Beth I. Fishman-McCaffrey, O.T.R., C.O.V.T., Registered Occupational Therapist, has been on the cutting edge of integrating Sensory Integration Therapy with Optometric Vision Therapy for over 20 years, enhancing the lives of hundreds of patients by improving their functional skills. She is certified in Educational Kinesiology (a holistic approach to helping the body increase learning potential) and as a provider for the Advanced Brain Technologies Listening Program with Bone Conduction. An educator for 25 years, Patricia A. Dunnigan has worked in public and private sectors with kindergarten-aged children. Her experiential enrichment program enhanced the lives of public school children. Now, she uses her teaching background in her role as vision therapist working with patients of all ages. Download a sample of the organization chart. needed this and our home feels much happier! morning routine, getting homework done and the bedtime routines have significantly decreased. routine tasks. Thanks to the organizational charts, we have more peace in our household. Be the first to review “SEE IT. SAY IT. DO IT!® Organize It! Workbook” Click here to cancel reply.